Inclusions: Vatican, Monaco & Isle of Man are included in the 'EU VAT Area' although are not part of the EU. 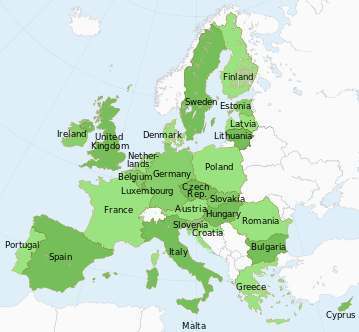 Exclusions: There are some areas of the EU that are treated, for the purpose of the EU VAT, as if they were outside the EU: Heligoland and Büsingen am Hochrhein in Germany; Ceuta, Melilla and The Canary Islands in Spain; Guadeloupe, French Guiana, Martinique and Réunion in France; Mount Athos in Greece; Livigno, Campione d'Italia and Lake Lugano in Italy; Aland Islands / Ahvenanmaa in Finland; the northern third of the island (the "Turkish Republic of Northern Cyprus", recognised only by Turkey) and the Green Line, in Cyprus; Faroe Islands in Denmark; Gibraltar on Spain, Akrotiri and Dhekelia on Cyprus in the United Kingdom; the Saimaa Canal and the island of Malyj Vysotskij, Finland leases from Russia; Saint Barthélemy, Saint Martin and the Clipperton Island in France; etc. As of date of publishing (July 2013) the 28 member states of the European Union (EU) are: Austria (Österreich), Belgium (België/Belgique), Bulgaria (България), Croatia (Hrvatska), Cyprus (Κύπρος), Czech Republic (Česko), Denmark (Danmark), Estonia (Eesti), Finland (Suomi), France (France), Germany (Deutschland), Greece (Ελλάδα), Hungary (Magyarország), Ireland (Éire), Italy (Italia), Latvia (Latvija), Lithuania (Lietuva), Luxemburg (Letzebuerg), Malta (Malta), Netherlands (Nederland), Poland (Polska), Portugal (Portugal), Romania (România), Slovak Republic (Slovensko), Slovenia (Slovenija), Spain (España), Sweden (Sverige), United Kingdom. The seven Outermost regions are integrated in the EU (some derogations to the EU laws may apply): French Guiana, Guadeloupe, Réunion and Martinique in France; Azores and Madeira in Portugal; The Canary Islands in Spain. The twenty Overseas countries and territories are not part of the EU but have a special relationship with one of the member states: Anguilla, Bermuda, British Antarctic Territory, British Indian Ocean Territory, British Virgin Islands, Cayman Islands, Falkland Islands, Montserrat, Pitcairn Islands, Saint Helena, South Georgia and the South Sandwich Islands and Turks and Caicos Islands with the United Kingdom; Mayotte, Saint-Pierre and Miquelon, French Polynesia, Wallis and Futuna, French Southern and Antarctic Lands (including the French Scattered Islands in the Indian Ocean) and New Caledonia with France; Netherlands Antilles and Aruba with the Netherlands; Greenland that was once part of Union before they voted to leave in 1982, with Denmark. The following European areas are not members of the EU: Albania, Andorra, Armenia, Azerbaijan, Byelorussia, Bosnia-Herzegovina, the Channel Islands (Bailiwick of Guernsey and Bailiwick of Jersey), Georgia, Iceland, Isle of Man (Mann), Kazajstán, Liechtenstein, ARY Macedonia (Македонија), Moldova, Monaco, Montenegro, Norway, Russia, San Marino, Serbia, Switzerland, Turkey (Türkiye), Ukraine, Vatican.